On January 15, 2007 (Drupal’s 6th Birthday), Drupal 5.0 was released. Neil Drumm acted as the Branch Maintainer for the past four years up until one final commit on January 6, 2011 to clarify the PHP compatibility. When Drupal 7 was released that meant that Drupal 5 was no longer supported. This announcement is merely a reminder of that fact. It is the policy (and, to large extent a matter of pragmatics) of the Drupal community to support only the current major release of Drupal (currently Drupal 7.x), and the previous release (currently Drupal 6.x). See Drupal’s version info for more details on this policy. What does it mean that Drupal 5 is no longer officially supported? You should not expect any of these issues to be fixed in Drupal core. The Drupal Security team will no longer solicit nor work to address issues that are reported in the 5.x branch of Drupal core or contributed projects. 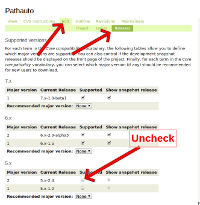 The Update Status module, introduced with Drupal 5, relies on XML from drupal.org. That XML is still used for newer versions of the module but may be changed in ways that break the Drupal 5 version of the Update Status module. If you are responsible for sites that are running Drupal 5.x, it’s time to upgrade to 6.x or 7.x. See instructions on how to upgrade and a video on Drupal 5 to Drupal 6 upgrade. Note that 7.x is still relatively young so you may not be able to make that transition just yet. Module, theme and project maintainers are encouraged to mark their 5.x versions as unsupported so it is clear to end users that these are no longer supported. You can do that by going to your project, clicking the Edit tab, clicking the Releases sub-tab, and unchecking the boxes for “Supported” in the rows for 5.x releases (screenshots below). You may be thinking “Hey, let’s keep Drupal number 5 alive!” You are not alone in this thought process. There is a Drupal Long Term Support group devoted to the concept but it has met with limited success so far. Much like we thanked Gerhard in the Drupal 4.7 End Of Life, we’d like to wish Neil Drumm a warm thank you for all his efforts with Drupal 5.